My family is a bit of a curiosity. When we are walking about, for instance in a crowded mall, people sometimes look. But when we sit down at a food court, that is when people stare and start mentally counting how many children we have. One, two, three, four, five…… Six! Our children are 12 yrs, 10 yrs, 9 yrs, 7 yrs, 4 yrs and 4 1/2months of age. And I *LOVE* to reply, “Actually, no, it’s not.” And put them in a moral bind. Ha ha. Of course homeschooling is legal in Singapore! Do I look like a criminal or something? At this point, mind all in a whirl, the word that sums up all the questions: HOW? HOW do you manage six children when my two children are already driving me up the wall? HOW do you teach all your children if you don’t send them to a school? ….These are the top three questions I face. But to answer all of them exhaustively would be enough to fill a book. Maybe I shall. One day. When the inspiration hits. Ours is certainly not the only large-ish family in Singapore who homeschools. In our homeschooling community, I believe we have a higher than average concentration of families with 4, 5, 6…9 children. These are very Singaporean families. We use lah and leh fluently. And yet, because families like ours challenge every assumption Singaporean society holds to be true, we are very “un”-Singaporean. Children are taxing, demanding, stressful, time consuming, expensive, noisy. And then they grow into *gasp* TEENS!! So 1 or 2, at most 3, children is realistic. 4 is suicidal. No wonder people, when they find out I have so many children, will remark “Wah, you very BRAVE hor.” Like a kamikaze pilot, yah? Our family size is something of an experiment. Any working theory or design or machine needs to go through testing. So if our God (we are Christians) says He is who He is, and He said that children are a heritage from Him, children are His blessings, then He will see us through every aspect of family life and child rearing. He has never failed us yet nor do we expect Him ever to fail us. We indeed are very blessed with much happiness. Each individual child brings a different dynamic into our family life to make it fuller and richer. So, the more the merrier. I’m glad to be homeschooling my children. 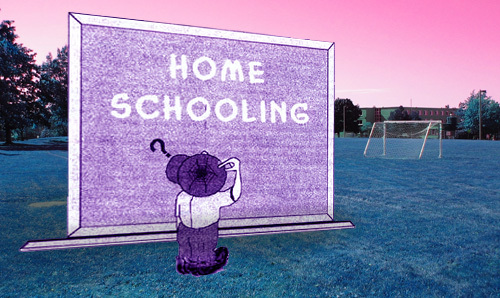 I feel homeschooling has helped to pull my whole family in the same direction instead of every child, every which way. Though they do enjoy playing with other friends, my children’s best friends are each other. We have a fairly stress free life because I do not have to play catchup with the school’s schedule. We do not have to force feed our children to meet the demands of CA, SA tests and exams. We have to take the PSLE but how we get to that goal is for us to go at our pace. No one would dare to say that our MOE way is the only way to being educated, right? So we take a different (may I say, gentler) path to reach the same goal. The ultimate goal in education is actually not the PSLE. The desired outcome of our homeschooling is to produce adults who are able to thrive in society, firmly grounded in their faith and belief in God. Schools function to help their students to sit for a terminating exam and attain a certificate. Homeschooling parents are helping their own offspring succeed in life, all the aspects of it- be it the building of character, physical, emotional, spiritual and, of course, academic development. Now that you have fought for a bullied worker, why not go further? Zainal Sapari to Parliament: Let’s be realistic about vulnerable workers. Thank you for sharing your experience as homeschooling parent. I am very intrigued and curious. My understanding from speaking to a number of people and someone who has done a Master degree research on homeschooling, this niche group of homeschoolers and homeschooling parents often have a strong support network group. Interestingly, they are often linked by their similar religious beliefs and faith. So my question to you is this: Is is viable for any aspiring homeschooling parents who are agnostic or aethiest to conduct homeschooling with little or no support network? Do you know of any non-religious affliated support network group in Singapore for this group of homeschoolers and their parents? What other constructive advice or input could you give this category of parents who attempt to also do the brave thing of homeschooling? From my observation, majority of homeschoolers in Sg are Christian. The homeschool community, however, is very inclusive, so families of different faiths can join in and interact, contribute, participate in many activities, co-ops. It’s a parent driven movement and up to you how you want to contribute. Through the singapore homeschool yahoo group, my family has participated in Sports Day, talent concert, fun fair. And it is non-religious in nature. I know of learning co-ops whereby the parents are from different religions. Other constructive advice? Answer the question Why homeschooling before the How homeschooling. Hi, I am thinking about homeschool my child and would like to get to know other families who are doing the same. I had sent an email to the homeschool yahoo group without getting any feedback. Can you please share the information on sports day, fun concert in regards to the homeschool group? Thank you.